Listen to "How To Lie With Statistics" on your iOS and Android device. Now available in audio for the first time! 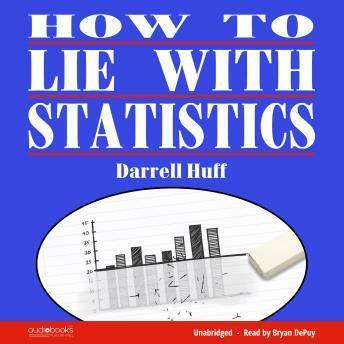 Darrell Huff's celebrated classic "How to Lie With Statistics" is a straight-forward and engaging guide to understanding the manipulation and misrepresentation of information that could be lurking behind every graph, chart, and infographic. Originally published in 1954, it remains as relevant and necessary as ever in our digital world where information is king-and as easy to distort and manipulate as it is to access. A pre-cursor to modern popular science books like Steven D. Levitt's "Freakonomics" and Malcolm Gladwell's "Outliers", Huff runs the gamut of every popularly used type of statistic, probes such things as the sample study, the tabulation method, the interview technique, or the way the results are derived from the figures, and points up the countless number of dodges which are used to full rather than to inform. Critically acclaimed by media outlets like The New York Times and the Wall Street Journal and recommended by Bill Gates as a perfect beach read, "How to Lie With Statistics" stands as the go-to book for understanding the use of statistics by teachers and leaders everywhere. I cannot recommend Audio Book services and Clubs enough!! Another book that I am reading. Not what you would call a highly creative book that captures you, it is all about statistic after all.